As this issue opens, the Kahori are getting some unwelcome visitors in the form of Woola, the white ape, Tars Tarkas and some Warhoons (who dislike Kahori more than Helium). 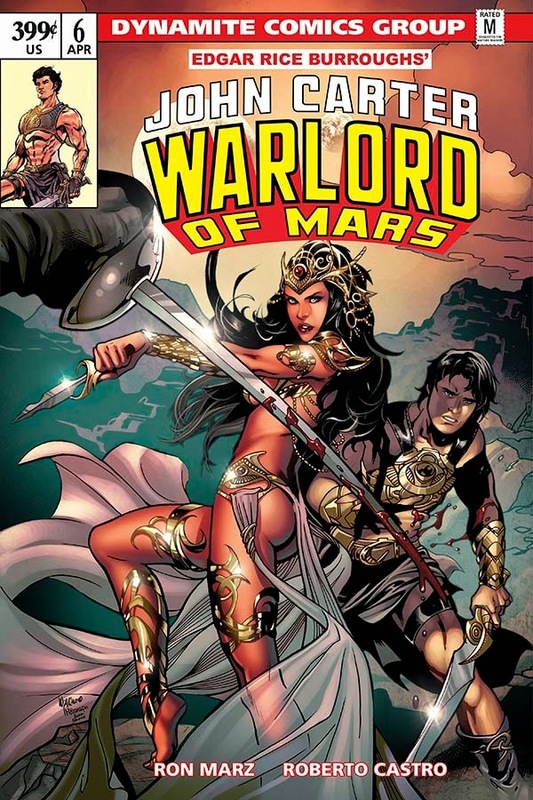 Meanwhile Carter is fighting it out with Joshua Clark for the fate of Barsoom, with both men willing to die to claim victory. But with that scheming scientist Vush Tanzar kidnapping Dejah, the battle isn't over until one man is left standing. Wrapping up his first story arc for the new series, Ron Marz delivers a good, rousing finale that gives closure to all the plot threads and helps set the stage for the future. The dialogue takes a back seat the sword fights, escapes and white apes but that's a welcome relief after all the setup and a reminder how good a comic book can be when the story just flows without much distractions. It may not have been the strongest opening story for this new series but it's a good tale brought to a close with a skillful hand. The biggest change here is in the artwork. 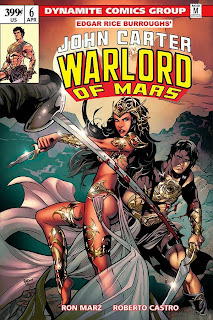 After five issues with Ahbushek Malsuni's amazing art for this issue we get Roberto Castro (who some might remember handled art duties on Dynamite's previous Dejah Thoris series) and he does a good job trying to maintain the establish look while juggling the action and characters. 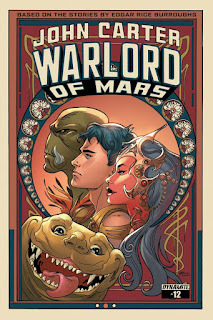 I know some get aggravated with series change artists but Castro delivers good work and, aided by the color and layout. With this initial story now closed I can't wait to see what the future holds for the Warlord and his incomparable princess. Next time another belated comic review featuring a familiar bad guy. Until then Kaor!